The Sister Chapel Commemorating its 40th year. GLASSBORO, NJ – The Center for Art & Social Engagement, a new program of the Rowan University Art Gallery, serves as a venue for investigating social issues through arts-based methods and presents its first program with photojournalist Susan Sterner’s exhibition, Estoy por aquí / I am here. This exhibition is presented in dialogue with The Sister Chapel, as an historic collaborative feminist installation that anchors programming for The Center for Art & Social Engagement. The exhibit is on display from March 14 – May 11, 2019 in Westby Hall on the Glassboro campus. A lecture welcomes the exhibit on March 14 starting at 5:00 p.m. in Westby Hall Room 111, and will commemorate the 40th year of the Sister Chapel. A reception will follow at The Center for Art & Social Engagement, Westby Hall Room 110. With Estoy por aquí / I am here, is an ongoing project that explores the challenges and contexts of women working in the informal economy of central El Salvador and the political and social upheaval that feeds a multigenerational cycle of emigration and fractured families. 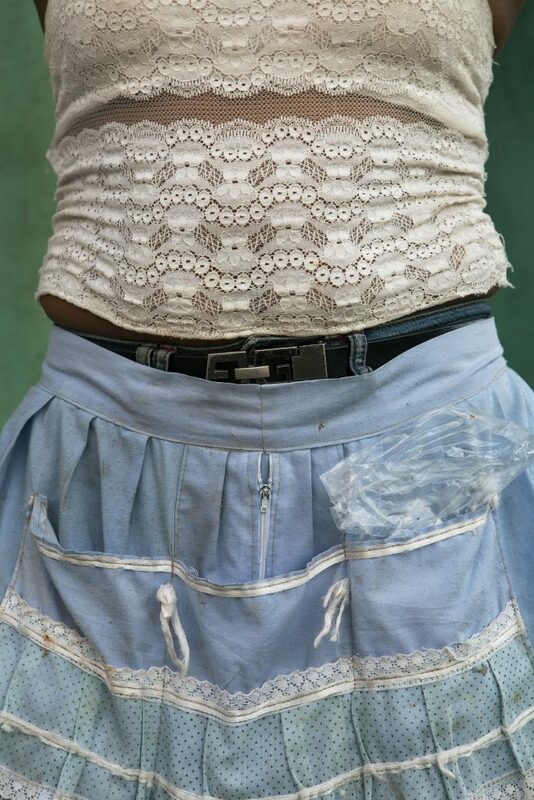 The objective of Sterner’s work is to expand the narrative around working class women of El Salvador, their roles in sustaining communities, and their connections to emigration to the United States. In addition to earning income in public markets and the informal economy, these women are identified by their use of elaborate aprons. The aprons feature layers of ruffled or embroidered lace often in eye- catching colors and textural combinations that accentuate the curves of their bodies. They also signal to potential clients that the women are capable and at work. Sterner is an educator and documentary photographer, who has worked as both a freelance and staff photojournalist with national and international publications. She has covered domestic issues such as immigration, child labor, and families in poverty as well as U.S. border issues and social change in Haiti, in addition to a fellowship with the Institute of Current World Affairs to photograph and write about women’s lives and access to resources in Brazil. She has worked as a White House photographer and, since 2006, has coordinated the undergraduate program in photojournalism as well as developing and launching a graduate program in New Media Photojournalism at the Corcoran School of the Arts & Design at George Washington University in Washington, D.C. Programming at the Center will encourage interdisciplinary themes that explore diverse and timely social issues through multidisciplinary practices, broadly conceived to include a variety of mediums such as photojournalism, film and video, historical ephemera, faculty and student research presentations, info-graphic presentations, STEM/STEAM installations, and public programming. The Center for Art & Social Engagement is located in Westby Hall room 110 on the university’s main campus, 237 Mullica Hill Road in Glassboro, N.J. Admission to the Center, lecture, and reception is free and open to the public. The Center’s hours are Monday – Thursday, 11:00 a.m. to 4:00 p.m. Directions can be found on the gallery website. For more information, call 856-256-4520 or visit www.rowan.edu/artgallery. Support for programming at Rowan University Art Galleries is made possible by funds from the New Jersey State Council on the Arts, a partner agency of the National Endowment for the Arts. Thank you to Mary Salvante and Jillian Schley for the content of this post. This entry was posted in Art, Art Galleries, Art History, Art in New Jersey, Experience Design, Fine Art Philadelphia, Installation, Lectures, Mixed Media Art, Multimedia Art, New Jersey Art, New Jersey Art Galleries, NJ, One-Person Art Show, Performance, Philadelphia, Philadelphia Art, Philadelphia Art Shows, Photography Philadelphia, Rowan University Art Gallery, Social Practice, Uncategorized, Works on Paper and tagged documentary, Estoy por aquí / I am here, Nj Art, Photography, Rowan University Art Gallery, STEM/STEAM, Susan Sterner, The Center for Art and Social Engagement opens with Susan Sterner ESTOY POR AQUÍ / I AM HERE in dialog with The Sister Chapel Commemorating its 40th year. DoNArTNeWs Philadelphia Art News Blog, The Sister Chapel on March 10, 2019 by admin1. February 11 – April 20, 2019. 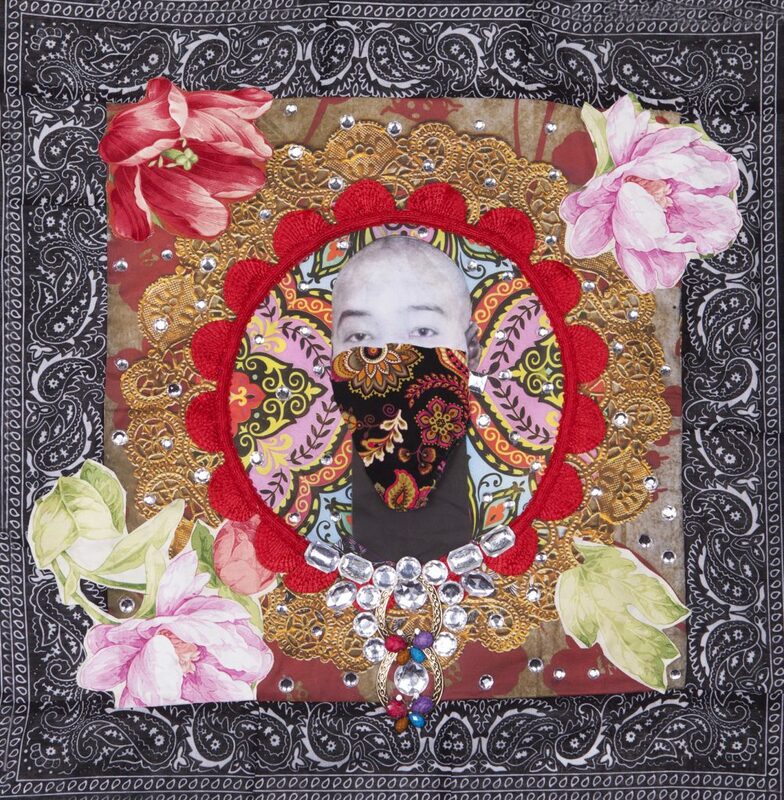 GLASSBORO, NJ – Known for her drawings, tapestries, videos, sculptures and installations that involve surfaces layered with flowers, glitter, lace and bead, Ebony G. Patterson’s works investigate forms of embellishment as they relate to youth culture within disenfranchised communities. 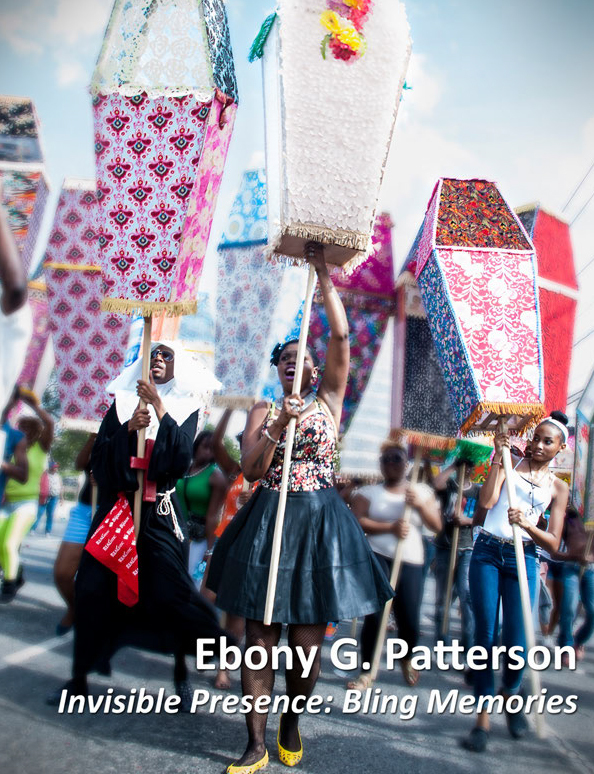 That work is the focus of the newest exhibition at Rowan University Art Gallery, Ebony G. Patterson: If We Must Die. The exhibit is on display from February 11 – April 20, 2019. In conjunction with the exhibit, a conversation with the artist will be held on Wednesday, March 27 at 5:00 p.m. in the gallery, led by visiting scholar Colette Gaiter, a professor in the Department of Art & Design and Department of Africana Studies at the University of Delaware. A reception will follow. The two featured installations – Invisible Presence: Bling Memories and Of 72 – employ opulent, hand-embellished surfaces and brightly colored patterns that entice viewers to bear witness to the violence and social injustices imposed on the invisible and the voiceless. Patterson’s neo-Baroque works address masculinity, “bling,” visibility, and invisibility within the post-colonial context of her native Jamaica and within black youth culture globally. The references to Carnival in Patterson’s use of beads, plastic ornaments, and reflective materials echo her interest in mining international aesthetics in her practice. Born in Jamaica, Patterson received her BFA from Edna Manley College in Jamaica and an MFA from Sam Fox College of Design & Visual Arts in St. Louis. She has had recent solo exhibitions at The Perez Museum in Miami, The Studio Museum in Harlem, Atlanta Center for Contemporary Art, and Monique Meloche Gallery in Chicago. She was featured in biennials in Havana, Cuba; New Orleans; Jamaica; and Miami. 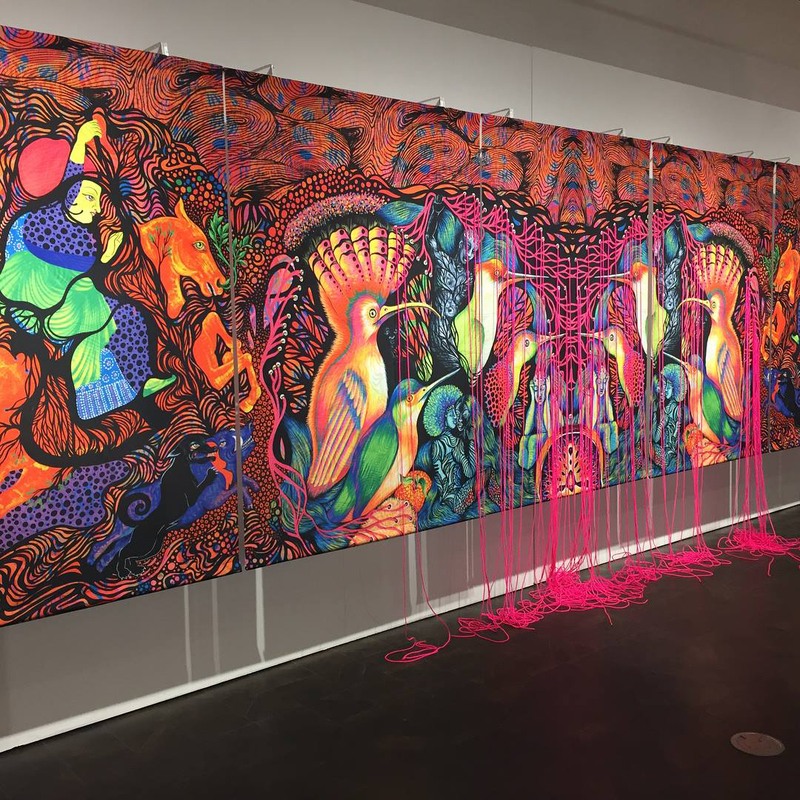 She has exhibited in Brazil, Boston, and New York, in addition to group exhibitions at Seattle Art Museum, National Art Gallery of the Cayman Islands, and National Gallery of the Bahamas among others. Her work is included in a number of public collections, including The Studio Museum in Harlem and the Museum of Art and Design, New York; Nasher Museum of Art at Duke University, Durham, NC; Speed Art Museum, Louisville, KY; 21c Museum Hotels; and the National Gallery of Jamaica, Kingston. The gallery is located at 301 High Street West. Free 2-hour public parking is available in the Mick Drive Parking Garage across the street from the gallery. Admission to the gallery, lecture, and reception is free and open to the public. Regular gallery hours are Monday – Wednesday, 10:00 a.m. to 5:00 p.m. and Thursday – Saturday, 10:00 a.m. to 7:00 p.m. Directions can be found on the gallery website. For more information, call 856-256-4521 or visit www.rowan.edu/artgallery. Support for programming at Rowan University Art Galleries is also made possible by funds from the New Jersey State Council on the Arts, a partner agency of the National Endowment for the Arts. Thank you to Mary Salvante for the content of this post. This entry was posted in African American Art, Art, Art Galleries, Art History, Art in New Jersey, DoNArTNeWs, Experience Design, Fine Art Philadelphia, Folk Art, Installation, Mixed Media Art, Multimedia Art, New Jersey Art, New Jersey Art Galleries, One-Person Art Show, Philadelphia, Philadelphia Art Galleries, Philadelphia Art Shows, Photography Philadelphia, Rowan University Art Gallery, Social Practice, Uncategorized, University of Delaware, Video, Works on Paper and tagged Art, Colette Gaiter, DoNArTNeWs, DoNArTNeWs Philadelphia Art News Blog, Ebony G. Patterson: if we must die, Invisible Presence: Bling Memories, mixed media art, New Jersey Art, Nj Art, Of 72, Philadelphia, Philadelphia Art, Philadelphia Art Gallery, Philadelphia Art News, Philadelphia Art Shows, Philadelphia Fine Art, Philadelphia photography, Photography, Rowan University Art Gallery, social practice, University of Delaware on February 28, 2019 by admin1. GLASSBORO, NJ – Rowan University Art Gallery welcomes guest curator Amie Potsic with this exhibition. Three women artists reframe the cultural construct of feminine as empowering in Enamored Armor. The opening reception and artist talk is on Thursday, November 29 from 6:00 – 8:00 p.m. The exhibit is on display from November 29, 2018 – January 12, 2019. Featuring work by Marjan Moghaddam, Mari Ogihara, and Tiantian Li, Enamored Armor includes references inspired by art history, cultural specificity, and contemporary society. The classical figure serves as a basis, as the artists investigate the multiplicity of ways in which women choose to present and redefine themselves in pursuit of potency and self-discovery. Through video, painting, sculpture, and Augmented Reality, their work spans a historical spectrum of millennia with a finger on the pulse of current artistic practice, the women’s empowerment movement, and emerging technologies. Marjan Moghaddam is an award-winning and pioneering digital artist and animator who works primarily with 3d computer graphics, motion capture, and digital media for animation, post-internet art. Her work has been exhibited internationally, in addition to curated shows at the Armory Show in NYC and Art Basel Miami. In her digital female bodies, Marjan utilizes aesthetic styles as part of a figural vocabulary that explores the evolving nature of humanity. The figures represent the deconstruction of the organic, and its fracturing and fragmentation as it migrates from the physical to the digital. Mari Ogihara’s work ranges from female figures to colorful biomorphic sculptures. She connects her understanding of how a samurai got ready for battle with the way women throughout history have prepared their physical appearance for sexual intimacy. Ogihara has held international residencies in France, Japan, Brazil, and Mexico in addition to multiple residencies in the United States. Tiantian Li’s work has been shown in numerous Philadelphia galleries in addition to major art museums in China. In her watercolors she explores ideation of female intimacy and emotions expressed through portraits of her lingerie superposition with portraits of historical characters from the renaissance period, which represents a time of enlightenment and romantic expression. She is encouraging women to take a positive perspective on their bodies and female representation while giving themselves the attention, humor, and respect they deserve. The Rowan University Art Gallery is located at 301 High Street West. Free 2-hour public parking is available in the Mick Drive Parking Garage across the street from the gallery. Admission to the gallery, lecture, and reception is free and open to the public. Regular gallery hours are Monday – Wednesday, 10:00 a.m. to 5:00 p.m. and Thursday – Saturday, 10:00 a.m. to 7:00 p.m. Directions can be found on the gallery website. For more information, call 856-256-4521 or visit www.rowan.edu/artgallery. “Baisser in Mary Boone, in Glassish & Waxish Glitch“ from marjan moghaddam on Vimeo. This entry was posted in Animation, Art, Art Galleries, Art in New Jersey, Augmented Reality, Clothing, Computer Art, Design, Digital Art, Experience Design, Fabric Art, Fashion, Fiber Art, Fine Art Philadelphia, Mixed Media Art, Multimedia Art, New Jersey Art, New Jersey Art Galleries, New Jersey artists, Philadelphia, Philadelphia Art, Philadelphia Art Galleries, Philadelphia Art Installations, Philadelphia Art Shows, Philadelphia Artists, Philadelphia Multimedia, Philadelphia Sculpture, Rowan University Art Gallery, Sculpture, Uncategorized, Video and tagged and Tiantian Li, Art, Art Installation, Augmented Reality, DoNArTNeWs Philadelphia Art News Blog, Enamored Armor, fabric art, Mari Ogihara, Marjan Moghaddam, mixed media art, Philadelphia, Philadelphia Art, Philadelphia Art Gallery, Philadelphia Art News, Philadelphia Art Shows, Philadelphia Artists, Philadelphia Fine Art, Rowan University Art Gallery, sculpture, The Potency of the Female Figure, Tiantian Li on November 27, 2018 by admin1. GLASSBORO, NJ – Heather Ujiie’s exhibition, Terra Incognita, opens the 2018-2019 season at Rowan University Art Gallery with a reception on Thursday, September 13 from 6:00 – 8:00 p.m. The artist’s work blend the disciplines of textiles, fashion design and visual art to create an ethereal, imaginary, and mythological world. The exhibit runs September 4 – November 17, 2018. In her work, Ujiie builds upon the imagery found in Hieronymus Bosch’s painting, The Garden of Earthly Delights, and infuses it with her own vision inspired by botanical studies, living networks, sexual identities, and commonalities between living creatures. Much of what the artist is currently creating has evolved out of re-contextualizing historic printed cloth, and illuminated manuscript paintings from the Moghul Empire, to contemporary symbols of the feminine in global cultures. Three mythological deities and animal hybrid forms – The Goddess, The Demon, and the Warrior – dominate the world created by the artist. Each of the textile installations and sculptural figures reveals the power of the female voice which can be at once loving and nurturing, while simultaneously conjuring mythologies around the femme fatale. Digitally-printed murals evoke narratives which question the human relationship to the fragile natural world, and the destruction of ecological systems, in our evolving planet. The Coby Foundation, and The Joseph Roberts Foundation have provided support for this project. Additional support is also made possible by funds from the New Jersey State Council on the Arts, a partner agency of the National Endowment for the Arts. Heather Ujii grew up in NYC’s Greenwich Village, part of a family of artist educators, and believes her creativity comes from a lively bohemian childhood. Her installations have been exhibited at the State Museum of Pennsylvania, Delaware Art Museum, Hunterdon Museum of Art, Racine Art Museum, Delaware Center for Contemporary Art, Philadelphia International Airport, and the prestigious Wind Challenge Award Exhibition at the Samuel S. Fleisher Art Memorial Museum. As a designer, she has more than 15 years of experience creating printed textiles for the high-end home furnishing and apparel markets. Her commercial designs have been used in such projects as decorating The White House private residence for President and Mrs. George W. Bush. Ujiie holds a Bachelor of Science degree in Visual Art from the State University of New York/New Paltz; an Art-Education K-12 degree from Brooklyn College; and an Associate’s Degree in Textile Surface Design from The Fashion Institute of Technology in New York City. She is on the faculty of Moore College of Art & Design and has design experience for dance, theatre, and textiles. This entry was posted in Art, Art Galleries, Art in New Jersey, Fabric Art, Fiber Art, Fine Art Philadelphia, Installation, Mixed Media Art, One-Person Art Show, Philadelphia, Philadelphia Art, Philadelphia Art Galleries, Philadelphia Art Schools, Philadelphia Artists, Philadelphia Artists, Rowan University Art Gallery, Uncategorized and tagged Art, Art Installation, DoNArTNeWs Philadelphia Art News Blog, fabric art, Heather Ujiie, HEATHER UJIIE: TERRA INCOGNITA, mixed media art, Philadelphia, Philadelphia Art, Philadelphia Art Gallery, Philadelphia Art News, Philadelphia Art Shows, Philadelphia Artist, Philadelphia Artists, Philadelphia Fine Art, Rowan University Art Gallery, weaving on September 12, 2018 by admin1. GLASSBORO, NJ – Exploring the confluence of arts, science, and activism Rowan University Art Gallery showcases the work of environmental artist Diane Burko in Vast and Vanishing. On display from March 8 – April 21. Diane Burko’s artistic practice is at the intersection of art, science, and activism focused on climate change. 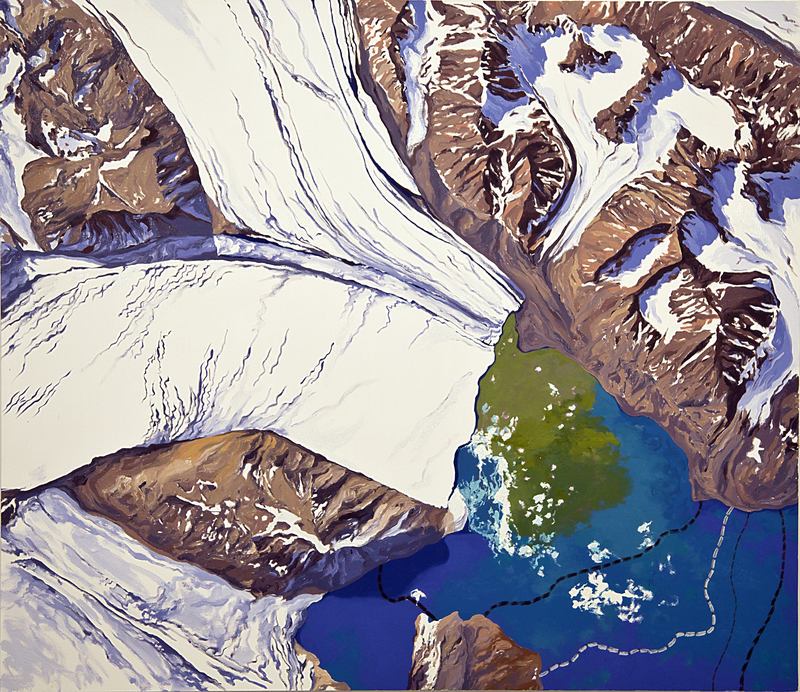 For over a decade, she has been documenting glacial recession in large-scale paintings and photographs developed in collaboration with scientists, studying their research, and utilizing their data. She is especially committed to understanding and incorporating climate science and sees this intersection as crucial to her artistic development. Her activism led her to make research expeditions to the ice fields of Antarctica, Greenland, Patagonia, and Svalbard where she documented and collected data for her work. 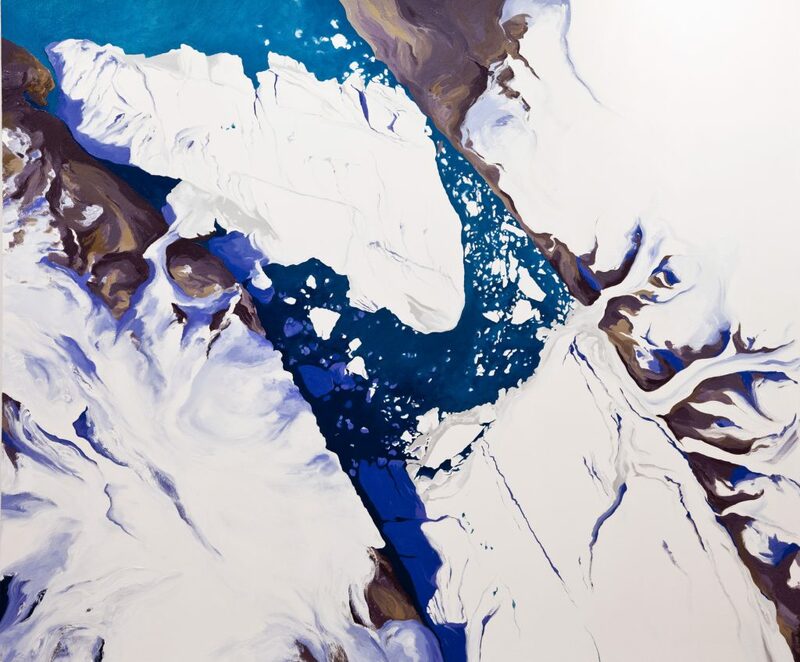 By employing many of the methods used by climate scientists such as recession lines, satellite imaging, and repeat photography, Burko’s research, coupled with her experiences, are translated into monumental paintings and photographs. The results are emotionally expansive works that function as a visual record of glacial recession, a call to action, and metaphor for the socio-political discourse on climate change. 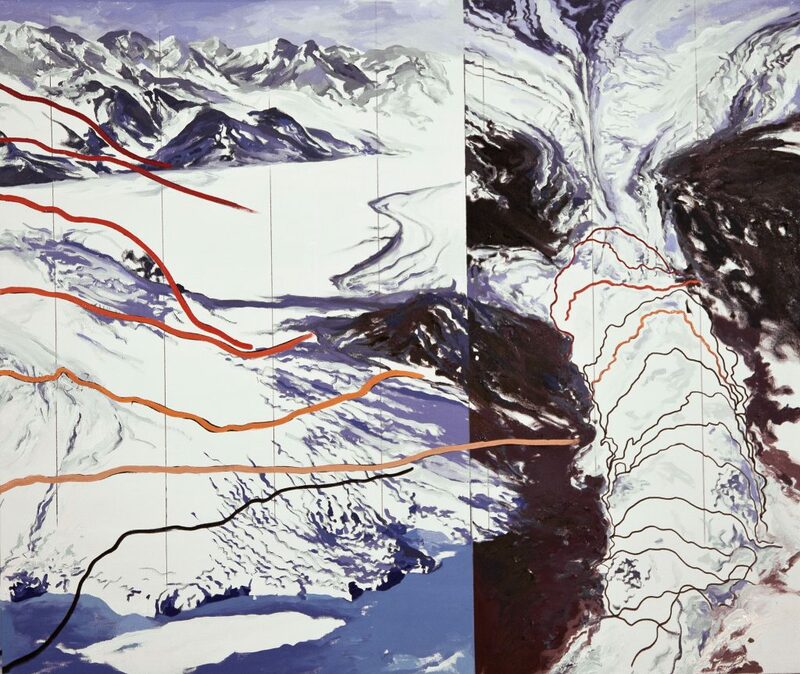 Curated by Mary Salvante, Vast and Vanishing comprises works that capture the inexhaustible dichotomies and the inescapable tension that Diane witnessed in these extreme frozen environments. Brooklyn-born. Philadelphia-based Burko focuses her work on monumental geological phenomenon. Since 2006 her practice has been at the intersection of art and science, devoted to the urgent issues of climate change. Her current work reflects expeditions to the three largest ice fields in the world. She has sailed around Svalbard with artists and also spent four days in Ny-Alesund with scientists from the Norwegian Polar Institute. She has visited Greenland’s Ilulissat and Eqi Sermia glaciers and first traveled to the Antarctic Peninsula in 2013, returning in January 2015, and explored the Patagonian ice field of Argentina. Burko’s expeditions can be followed at www.dianeburko.com/polarinvestigations. Aside from showing her art, Burko has gained attention from the scientific community, often speaking on how the arts can communicate science. She is an affiliate of INSTAAR, and has participated in numerous conferences such as those hosted by the Geological Society of America and American Geophysical Union. She is committed to public engagement, using both facts and images to make the invisible visual and visceral. Rowan University Art Gallery is located at 301 High Street West. Free 2-hour public parking is available in the Mick Drive Parking Garage across the street from the gallery. Eynon Ballroom is located in Chamberlain Student Center on the university campus. Admission to the gallery, discussion, and receptions is free and open to the public. Regular gallery hours are Monday – Wednesday, 10:00 a.m. to 5:00 p.m. and Thursday – Saturday, 10:00 a.m. to 7:00 p.m. Directions can be found on the gallery website. For more information, call 856-256-4521 or visit www.rowan.edu/artgallery. This entry was posted in Art, Art Galleries, Art History, Art in New Jersey, Collage, Computer Art, Experience Design, Fine Art Philadelphia, Installation, Mixed Media Art, New Jersey Art, New Jersey Art Galleries, NJ, One-Person Art Show, Paintings, Paintings Philadelphia, Philadelphia, Philadelphia Art, Philadelphia Art Galleries, Philadelphia Art Installations, Philadelphia Art Schools, Philadelphia Art Shows, Philadelphia Artists, Philadelphia Artists, Philadelphia Photographers, Photography Philadelphia, Rowan University Art Gallery, Social Practice, Uncategorized and tagged ACTIVISM, American Geophysical Union, AND THE ARCTIC, Antarctica, Art, Art Installation, Climate Change, Diane Burko, DoNArTNeWs, DoNArTNeWs Philadelphia Art News Blog, Eqi Sermia, Geological Society of America, Greenland, Greenland's Ilulissat, INSTAAR, Mary Salvante, mixed media art, National Endowment for the Arts, New Jersey State Council on the Arts, Norwegian Polar Institute, Ny-Alesund, paintings, Patagonia, Philadelphia, Philadelphia Art, Philadelphia Art Gallery, Philadelphia Art News, Philadelphia Art Shows, Philadelphia Artist, Philadelphia Artists, Philadelphia Fine Art, Philadelphia photography, Photography, Rowan University Art Gallery, Svalbard, Vast and Vanishing on March 9, 2018 by admin1.